Mercury, the smallest planet, goes whizzing around the Sun at a dazzling 31 miles per second. The planet travels so fast that it makes a complete loop in only 88 days. People have known about Mercury for thousands of years. It is named for the Roman god, Mercury, the fastest of all the gods. All about Mercury, the smallest planet. This planet is the densest planet next to Earth. Mercury is the densest planet next to Earth. It has a solid core and crust. Its core is made of metal – mostly iron. Its crust is made of rock. Because Mercury is so small, it has a very weak magnetic field. Gases, like oxygen or hydrogen, blow away into outer space. Mercury doesn’t have a blanket of gases to protect it like Earth. Instead, it has a very thin atmosphere. When comets and meteors enter the Earth’s thick atmosphere, they usually burn up long before they reach Earth. When comets and meteors enter Mercury’s atmosphere, they don’t slow down. Instead, they slam into the planet, causing craters and pock marks. 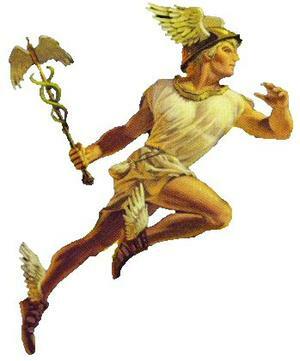 Mercury planet is named for the Roman god, Mercury, the fastest of all the gods. 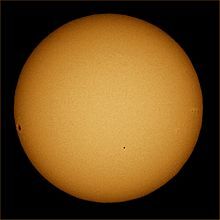 Mercury has extreme temperatures because it is so close to the Sun and because it has almost no atmosphere. The sunny portion of the planet has a temperature of 800 degrees. The other side of the planet is -300 degrees. Ouch! Mercury can be seen from Earth. Look for it just as the Sun rises in the morning or as the Sun is setting at night. It looks like a bright star that sits close to the Sun. Mercury is just a bit larger than our moon. Some of the craters on Mercury are very deep. Scientists believe there is frozen ice in deep craters at the poles. One crater is over 8 miles long. If you weigh 60 pounds on Earth, you’d weigh only 18 pounds on Mercury. All About Mercury: It has a solid core and crust. Its core is made of metal – mostly iron. 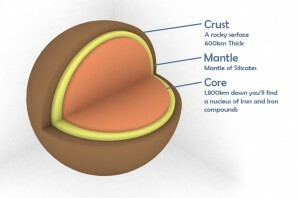 Its crust is made of rock. A video documentary all about Mercury. Question: Does Mercury have volcanoes on it? Answer: Mercury’s crust is too hard and thick for volcanoes to form. There are no tectonic plates that move like there are on Earth. Scientists believe Mercury might have a molten, or liquid metal, crust, but the molten liquid can’t erupt through the surface. Enjoyed the Easy Science for Kids Website all about Mercury info? Take the FREE & fun Mercury quiz and download FREE Mercury worksheet for kids. For lengthy info click here. Declan, Tobin. " Mercury Facts for Kids ." Easy Science for Kids, Apr 2019. Web. 21 Apr 2019. < https://easyscienceforkids.com/all-about-mercury/ >.